2016 marked 50 years of the National Trust's dedicated programme to care for coast. Currently we look after: White Cliffs of Dover, Giant's Causeway, much of the Llyn coast, and hundreds of well-loved beaches, cliffs, estuaries and islands across England, Wales and Northern Ireland. In 1965, John Betjeman wrote of the many threats to our coast in his poem One & All, from where we derive our title: our relationship with the sea affects us all. Trust New Art, the Trust's contemporary arts programme, celebrated this deep connection to the sea by working with Sound UK to commission a significant online digital experience conceived and developed with artdocs and The Swarm. Three leading artists Tania Kovats (visual arts), Owen Sheers (poetry), Martyn Ware (sound and music), have worked with award-winning film maker Benjamin Wigley to create an online digital journey through poetry, sound, film, and tide. Upon arrival you'll be asked to put on headphones and choose an artwork. If you've selected Tania Kovats, Tide you'll then experience a digital drawing that tracks high tide in real time. 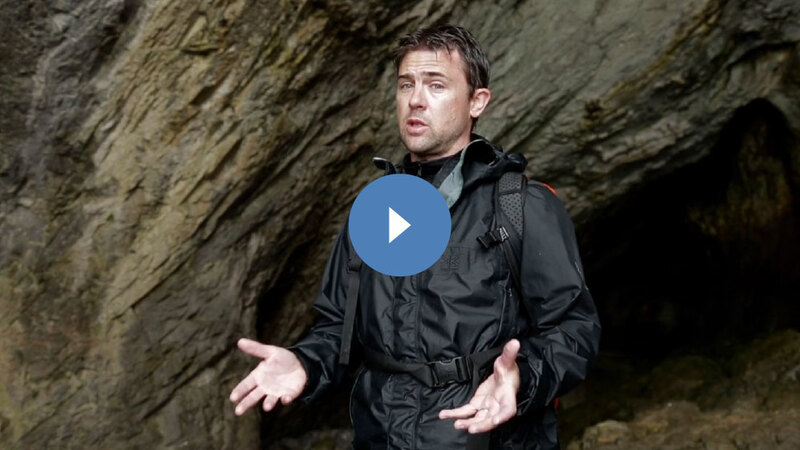 In Owen Sheers, On The Sea's Land (Ar-for-dir) you'll be given the choice of experiencing his poetic coastal walk on the Gower from Paviland Cave to Wurm's Head or vice versa. Martyn Ware's, What Does The Sea Say? enables you to mix an audio-visual installation of seaside memories and post-industrial seascapes. There’s also the option to take a walk with us through a virtual coastal landscape. There are three coastal walks taken from many UK locations, including Brancaster, Dunwich Heathland, Orford Ness, Seaham, Jurassic Coast (the Golden Cap), Sennen (Lands End), Porthgain, Wurms Head and Rhossili (Gower). Each takes approx. 3 – 5 minutes although you can jump to different places by clicking on ‘Where Am I?’ at the top. Along each walk you will discover one of the artworks created by Tania Kovats, Martyn Ware and Owen Sheers, as well as sea vistas and moments from nature where you can stop for a moment, watch and listen. An exhibition at Somerset House saw the dramatic staging of these digital artworks in the River Rooms located on the Thames from 4 November to 13 December 2015 to launch the project. One and All is a very ambitious project and an exciting voyage of discovery for me both in terms of the development of my work as an artist film maker, the collaborative working process with the artists and the incredible and beautiful coastal locations that I was lucky enough to capture. The UK has such a wealth of beautiful and varied coastlines that it was a privilege to explore and immerse myself in these environments. The coast is an incredibly inspiring place to make art and I think the work produced by all artists, designers and producers is something that everyone will appreciate. All artists on this project, including myself, had a heartfelt and honest response through the process of making, and I hope that whoever experiences this art online and in the exhibition are transported to a place which inspires their own personal connections or memories of the coast, and will hopefully encourage them to make more. It is a place where we can submerge ourselves, let the waves and the wind surround us, and experience something truly unique. Ben Wigley, is an artist and filmmaker whose work explores the journeys we take in life within the space between documentary and art. He is currently interested in the connections we make between memory and place, and how we talk about our lives through the metaphors of the natural world. Ben and his company artdocs have worked with many organisations and artists including BBC SPACE, British Council, Tate, Arts Council England, Benjamin Zephaniah, Sir Paul Smith, Paa Joe. Tania's commission explores a fascination with the interaction between sea, land and people. Tide is a digital drawing that tracks high tide in real time as it moves across the coastal edges of Britain. Here, the viewer can accelerate the tide, discover harbours and headlands that describe the edge of mainland Britain from the vantage point of the sea, whilst hearing the sound of a wave slowed down to tide time. Tide was designed by Tania in collaboration with software artist Johan Bichel Lindegaard. Johan has sourced data from almost 400 locations around the coast of the British Isles and created a dynamic map that blends in with Tania's analogue photographs of drying salt. The map disappears into the background and only as the high tide moves the outline of the coast is revealed. The data points are transformed into a spatial map using a mathematical way of dividing an area into polygons called a voronoi tesselation the tesselated map is then blurred to create a smooth transition between areas. 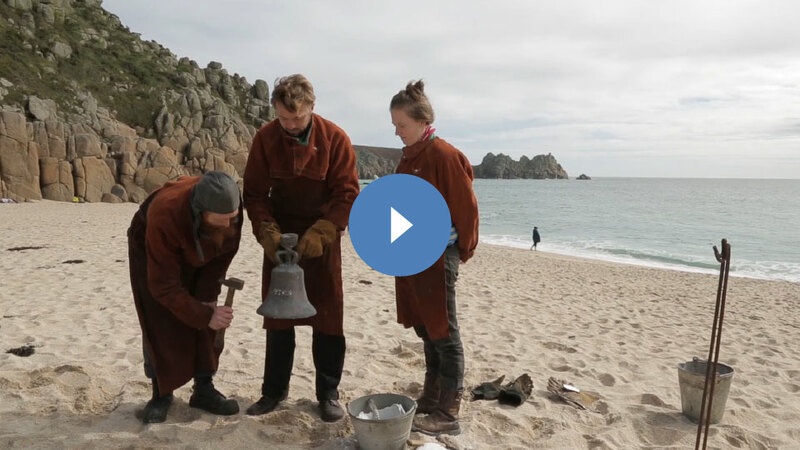 For the exhibition at Somerset House, Tania worked with foundry Ore &plus; Ingot to cast a bronze bell on Porthcurno beach in Cornwall. The bell was rung at high tide on the River Thames throughout the exhibition. Tania Kovats makes drawings, sculpture, installations and large-scale time-based projects exploring our experience and understanding of landscape. She is best known for Tree (2009), a permanent installation for the National History Museum in London. Her exhibition Oceans (2014) at Fruitmarket Gallery focussed on her fascination with the sea alongside her major publication, Drawing Water. Her Cape Farewell Lovelock Art Commission Evaporation is currently on show at Manchester Museum of Science and Industry. She has been nominated for the 2016 Max Mara Art Prize. Tania Kovats is represented by Pippy Houldsworth Gallery, London. Owen spent two weeks walking and researching the Gower's southern coastline between the Upper Paleolithic archaeological site of Paviland Cave and the striking causeway peninsula of Wurm's Head. His poem's prologue presents visitors with the essential directional choice of coastal walking - sea on the left or sea on the right. Following this choice the poem can be experienced in either direction. Drawing upon local history, anecdote and dialect, On the Sea's Land seeks to explore and excavate the internal and external geography of this ancient, yet ever-renewing landscape, against which our presence, whether communal or solitary, is never less than fleeting. Owen Sheers is an author, poet and playwright. Twice winner of Welsh Book of the Year his other awards include the Amnesty International Freedom of Expression award for his play The Two Worlds of Charlie F. and the Hay Festival Poetry Medal for his verse drama Pink Mist. Currently Professor in Creativity at Swansea University, Owen's latest novel I Saw A Man is long listed for the Prix Femina Etranger. Pink Mist, produced by Bristol Old Vic, will play at the Bush Theatre, London in January 2016. Martyn has vivid childhood memories of outings to the seaside from his native Sheffield which inform his commission. He explores coastal places with a strong link to our industrial past: the concrete installations in Orford Ness, Suffolk; the 'black beaches' at Seaham, County Durham; and the village of Porthgain, Pembrokeshire. 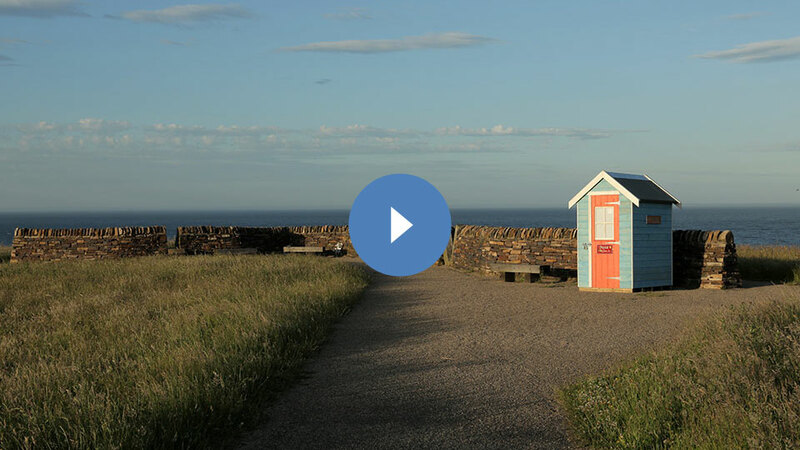 He captured stories from the public in his portable beach hut and wove them into his composition which uses a programme called 3DAudioScape codesigned by Martyn, which enables multiple sounds to be moved through 3D space simultaneously. Online the viewer is able to mix their own audio-visual installation over Martyn's soundscape using Benjamin Wigley's film elements. Founder of The Human League and Heaven 17, Martyn founded Illustrious with Erasure's Vince Clark to create new forms of spatialised sound composition using their unique three AudioScape surround-sound system. It has been used for over sixty unique projects with digital and fine artists in a range of historic and contemporary settings. Previous projects include: Stand with Syria, a huge immersive soundscape for Oxfam and Children in Need in Trafalgar Square: Panorama Copenhagen; and Tales From The Bridge for the London Olympics 2012. Commissioned by Trust New Art and Sound UK. Supported using public funding by the National Lottery through Arts Council England and PRS for Music Foundation. We'd love to hear what you thought about One and All, and would be hugely grateful if you took a few moments to fill in this online survey. Thanks!